Station Details: Davis Wireless Vantage Pro-2 Plus with FARS, Leaf & Soil Moisture/Temp Sta + WeatherLink IP. Sharx 3905 HD, HTNC4430XIR, HTNC4503M webcams, controlled by SecuritySpy 4.2.9, WeatherCat 3.04, macOS 10.14.5ß Build 18F96h (Mojave). Thanks to Edouard for the heavy lifting. I think this is about the cheapst you’ll find the 6555 but by the time you add in the ridiculous S&H, I suspect you can do better with a good internet search. The only thing you’ll need out of the box will be the logger, running the software requires Windows. Plug in to the console and the other end into your router or router extender via as long of a cable as required as long as it has a free Ethernet port. Or an Ethernet hub as Edouard mentioned. Once ordered, we’ll go over configuring WC properly (or you can read the manual or the WC Wiki). And why you’ll need an IP scanner (the free LanScan works just fine) to eliminate any guessing about identifying the station’s address which WC will need. Since you’re already familiar with WC, you know what your upload options are. I would buy the Meteobridge Nano instead of the WiFi unit mentioned earlier in the thread. My 0.02¢. A clear conscience is a great pillow. Thanks for the reminder! I just plain forgot about that option. P.S. So did you decide to buy one and try it out? 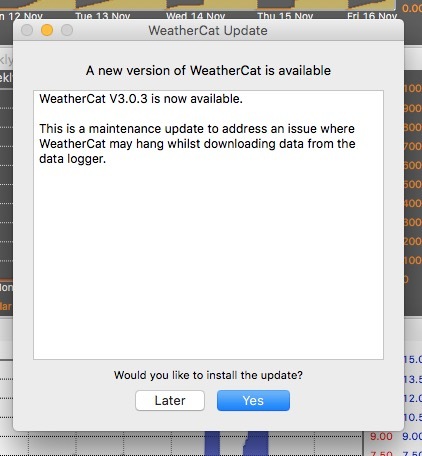 I always prefer to know that a product works with WeatherCat before recommending it to any other WeatherCat user. Having invested in the IP data logger I would never go back to something that required a driver. The IP logger can also by plugged into an Apple Express (or Airport) if that is handier than an ethernet outlet. I view WeatherCat as a server style program, ie, that should rarely be shutdown and upgraded only when something breaks. In that vein, how do I turn off this annoying update banner (besides updating)? Maybe I'm missing something simple, but the idea that this should pop up every few hours/days is insane. I still have the Beta version running and I don't think that reminder was in that version, of course. That option (revert to the Beta) should still be available. Of course, there is always the option of 'writing up the problem and letting maintenance fix it'. Just be sure to make the writeup clear and precise. Bold and Italics often help. P: Something loose in cockpit. S: Something tightened in cockpit. P: Aircraft acting up again. S: Aircraft told to shape up. I got rid of the banner by updating. The newest release is stable and working great for me. I understand that upgrading will remove the banner. Can you see how a banner that doesn't go away is a poor design? Just have a look back through all the previous releases that have problems to see why I wait so long. Thanks. I understand that upgrading will remove the banner. While not a "banner", I blame Apple and their "cleverly" worded "Updates available" Notifications for 'leading the way' to too many chances to mistakenly update something. Many apps have a setting for checking for an update "Once a week", which seems satisfactory to me. I also wonder if Apple's tightening security is making this harder for Devs. And then there is the all-day, every-day, red dot on System Prefs telling me to enable two-factor authentication. Did that once. Fooled me once. Never again. I'm not running a business, this is my home, if the thief takes my hardware, not even 2FA will prevent losing my recipes and family pictures. On my iPhone, I click "Not now" to the update offer. Then up pops the License agreement! WHY?! Finally I click "Disagree" and that seems to get the message cross. Should have made it clear I was being sarcastic, although truthful.